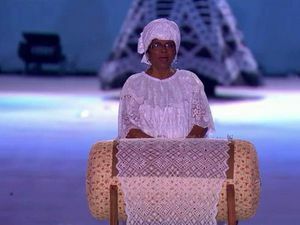 What better way to recognize the bobbin lacemakers of Northeastern Brazil than to sing the famous song “Olé, Mulher Rendeira” at the Olympic closing ceremonies in Rio last night. Lace designs played on the floor in lights, and a lacemaker stood at her pillow in the center of the patterns. 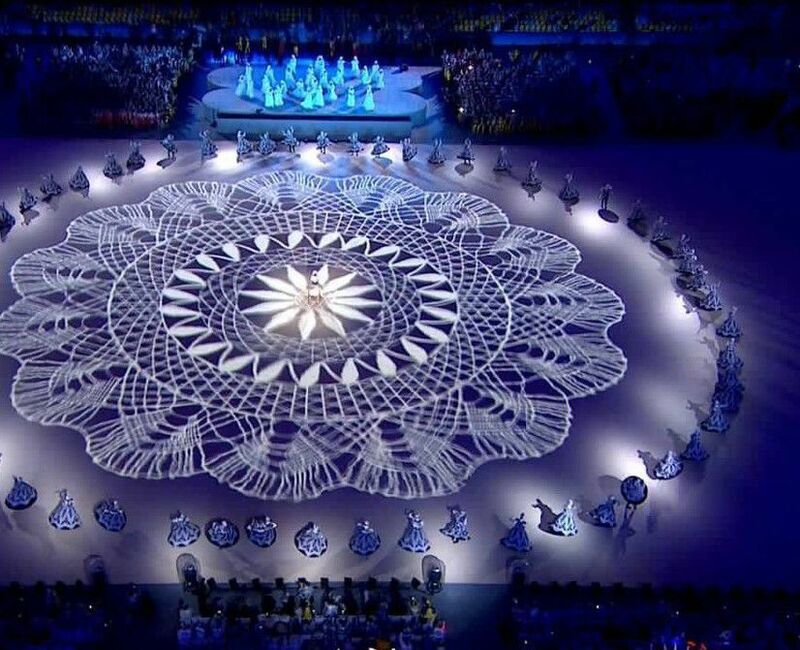 It was in the part of the show acknowledging Brazil’s history of slavery and Portuguese colonization. Renda di Bilros came directly from Portugal (where it is still widely practiced), and the site http://tinyurl.com/hbzfdje discusses ties with slavery. The song itself is widely sung in Brazil and often danced to by children with their lace pillows: http://tinyurl.com/jr6myam (my absolute favorite is http://tinyurl.com/js6g6t3). The traditional bobbin is made from a long stick with a palm nut at the end for a weight, although this has largely been replaced by heavy wooden bobbins – there are many YouTube videos of Brazilian lacemakers: http://tinyurl.com/zo9t6ky (here is my favorite, http://tinyurl.com/h693bwt – what to do with all your leftover cable spools). The lace tends to be highly colored, and we often see these products in New Mexico. Here is a wonderful video of a lacemaker, Dona Olinda, singing Olé, Mulher Rendeira as she works at her pillow http://tinyurl.com/jdxq7gq. She also describes some of the traditional equipment, including the palm nut bobbin, cactus thorn pins, and banana leaf-stuffed pillow. Que eu te ensino a namorar. Aqui vem Lampião , amando, gozando e querendo bem. Here comes Lampião, loving and enjoying life, wishing everyone well (or looking good? ).